The annual spring breakfast for Greenwood Cemetery will be held on Saturday, April 29 at the Clarksville American Legion. Biscuits & gravy, grilled sausage, eggs, pancakes and drinks will be served from 7-9:30 a.m., for $8. 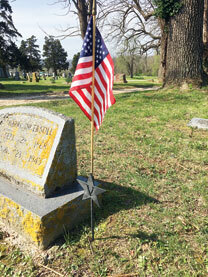 For many years Memorial Day weekend at Greenwood is the site of American flags decorating veterans’ graves. Starting this year, some of these flags will be held in metal flag holders crafted by students at the Pike-Lincoln Area Vo-Tech school in Eolia. Under the direction of instructor, Scott Hipes, the welding class laser cut the star shaped metal design with a “V” cut out and the auto body class painted them. A ten dollar donation would ensure that a veteran grave of your choice will be recognized and the flag holder will be installed in time for the 2017 Memorial Day weekend. All proceeds will be used to pay for supplies to complete the second phase of this project so every veteran grave will be permanently designated. More information will be available the morning of the breakfast for anyone who would like to support this endeavor sponsored by the cemetery board. Each year we like to honor our veterans who are buried at Greenwood and share some of their stories with the community. A well-known family who lived in the Clarksville area since the 1800s raised a family of children who served our nation proudly and this is a chapter from their family story. 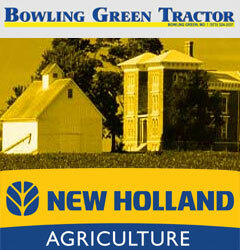 Edward Hall Bryant was born Feb. 19, 1890 on the family farm owned by his parents, Ben W. & Florence (Beauchamp) Bryant. Edward married Genia Price Witten on May 20, 1914. She was the daughter of Simeon and Buannah Dudley Witten of Cyrene. To this union were born 12 children and all 12 children and three of the grandchildren were born in the same home Ed was born in on a farm south of Clarksville on the hill locally known as Kissinger Hill. One of the 12 children, Edward H. Bryant, age 94, and living with his wife Gertrude Kahler in Colorado Springs, Colo., retired as a Lt. Colonel from the Air Force, serving over 29 years as a pilot. He flew 13 missions over Berlin and also flew in Vietnam. Ed wrote in his memoirs about life on the farm in the 1920s and 1930s. He said growing up on the farm was a great experience and he wouldn’t trade it for anything else he had done in his life. As he recalls, “at 5 years old I started milking cows. I would be awakened at 4:00 am. Between 4 am and 8 am my father, brothers and I would milk as many as 20 cows twice daily, seven days a week. We had a milk separator that was hand operated and would separate the milk from the cream. Breakfast was served at 6 am, prepared by mother and my sisters. After breakfast we would feed the chickens and other livestock. We walked about 2 miles to the Salem School, crossing fields and climbing fences, some barbed wire. It was a lot easier for the boys in their overalls but hard for the girls in their dresses. Salem school had one classroom and a hall for hanging coats and lunch boxes. Each grade would move up to the front of the class when it was their time for instruction.” Ed also recalls when he was in the 7th & 8th grade he was the school janitor, arriving early to start the wood stove and keep it burning all day and keep the floors swept. His pay was $2.50 a month. With this money he purchased a 22 single shot bolt action rifle from a Montgomery Ward catalog for $2.49. Florence Bryant, who married Devoid Mitchell, raised their family and farmed in the Ramsey Creek area. Florence, Devoid, one son, Sidney Mett, and one granddaughter Mary C. Mitchell, are buried at Greenwood. Benjamin Witten Bryant was drafted into the Navy during WWII and later farmed in the Clarksville bottoms. Witten and his wife, Ruth Ellen Gentry, are buried in Greenwood. Jack Dudley Bryant enlisted in the USAF during WW II as an aircraft mechanic. He spent time in South Africa, Sicily, Italy and Turkey. He was married to Beth Jones and retired to Reno NV after serving 25 years in the military. Ann Elizabeth Bryant married George Praul and they lived most of their married life in Clovis, NM. Dorothy Bryant Minor spent her life in the St. Louis area and was in banking. She is buried in Greenwood in the Bryant family plot. Mett Beauchamp Bryant served with the Army in WW II for 4 years mostly in Germany. He came back and did what he loved and farmed the Bryant acreage. He was married to Betty Jo Creamer and she survives. Billy John Bryant enlisted in the Air Force, retired after 23 years and served in England and Taiwan. He and his wife, Jeanne Powers, retired to Del City, Okla. He later retired from General Motors. Julia Lorena Bryant married Alex Oblein who served in the Air Force and retired after 26 years as a Master Sergeant. After their retirement they returned to the Clarksville area and are buried in the Bryant family plot. Joseph Biggs Bryant enlisted in the Air Force and retired after 26 years as a Master Sergeant. He is married to Nancy Faye Bryant and they reside in Sebring FL. Mary Louis Bryant married David Neikirk and spent most of their married life in Clovis N.M.
Paul Ambrose Bryant was the only son who was prevented from serving in the military because of a vision problem. He and his wife, Mary Gentry who survives, retired to Florida. The Bryant family was a large happy family. They all had their job to do and did so willingly for the good of all. Many grandchildren still live in the area and one is Naomi Mitchell Lewellen who serves on the Board of the Greenwood Cemetery.